As the graphic illustrates, many new niche solutions have emerged, for abstract management, association management, attendee tracking, check-in and badge printing, customer relationship management and marketing automation, digital marketing tools, exhibitor and floor-plan management, housing, lead retrieval, matchmaking, presentation management, registration, staffing, transportation, venue management, and virtual- and augmented-reality systems. Additionally, we now have event mobile apps, second-screen technologies, beacons, smart badges, virtual meeting solutions, and simple/small meeting systems. These solutions have automated previously manual processes and, in many cases, delivered new functionality that either improved the event participant’s experience or helped stakeholders drive participants’ behavior. They are often described as “disruptive” because they break the mold on how meetings technologies functioned in the past, or are addressing a need that had not been met. More recently, integration suppliers have emerged that can combine these niche products through application program interfaces (APIs) to create highly customized, end-to-end solutions. These solutions are the choice of organizations looking for specific functionality, easier implementations, or lower price points than enterprise solutions. Additionally, organizations are now free from a single-supplier development roadmap, which threatened to dictate the meeting technology capabilities available in the marketplace. Attendee Check in. In the past, if planners had to control access to an event, they would put a check-in table at the entrance, verify credentials, and have attendees physically sign-in to the session. This was often a time-consuming and inefficient process that frustrated everyone involved. Today, access to events can be controlled and documented through the use of a badge reader, or more recently, a facial recognition system that identifies authorized participants and creates a badge on the spot. Participant Engagement Measurement. Enhancing participant engagement and satisfaction have long been goals of event stakeholders who invest in live events to connect with customers and garner brand loyalty. These stakeholders are under considerable pressure to demonstrate that live events are a valuable part of a marketing campaign and to prove, using event data, that the 20 percent to 30 percent of their marketing dollars spent on live meetings is justified. Historically, meetings management programs have not been able to clearly articulate an ROI because of the difficulty in measuring whether event goals have been achieved. However, meeting technologies are making it easier to document participant engagement and satisfaction, session attendance and feedback, lead capture, and overall event health. With the advent of new digital engagement tools, it is easier to document event or strategic-level ROI through the touchpoints event participants have with attendee registration apps, event apps, second-screen technologies, smart badges, and beacons that collect, consolidate, analyze, and report on the data. Sourcing Simple Meetings. Other emerging technologies are improving the processes around simple meetings, which typically comprise 70 percent to 80 percent of a company’s meetings. These tools are purpose-built to help planners identify and contract with venues for events that do not have complex space or food and beverage requirements, and can therefore be sourced without a complex RFP process. Some of these simple meeting solutions also contain curated venue content, providing access to interesting and unique venues that are often in demand by organizations with virtual teams of employees. A very attractive aspect of simple meeting technologies is that they do not require an RFP, and so the human effort normally needed to create and evaluate RFPs is eliminated, or greatly reduced. Not only is this process efficient, but it can also significantly reduce the headcount needed for sourcing simple events, especially when this function is outsourced to a third party. An added benefit is that simple meeting solutions are much less costly and simpler to implement than enterprise systems. While efficiencies and cost savings are critical, new technologies can also be disruptive, with adaptation taking years to happen fully. Several constituencies are impacted, including meeting planners, meeting management program owners, and meeting management companies. For meeting planners, it can be a demanding job to keep up with the new technologies and to know which are the best to perform specific tasks. And then there’s the time commitment involved in learning and incorporating them into environments where other meeting technologies are already in use. For meeting management program owners, there are challenges around developing a technology strategy, given all the options, and navigating the potential risks. Even if a tool seems perfect, it may have an unproven track record, or have questions around its long-term financial viability (approximately 75 percent of venture-backed startups fail). Another responsibility that falls on meeting management program owners is determining which niche solutions play nicely together technologically, and then developing a strategy for which products should be responsible for which functions. For example, if an organization already has an enterprise-level meetings management system, but sees value in adding a non-RFP-based simple meeting solution, the program owner will have to decide which platform will handle which events, possibly based on the size, complexity, attendee type, and number of breakouts of an event, as well as who will manage the process. Which brings us to one other area of significant potential disruption. If a third-party or meeting management company sources events using an enterprise platform, but will not be needed to process simple meetings, the service configuration and business relationship between the client and the third-party or meeting management company will likely need to be amended. This will have substantial financial impacts and potentially cause staff reductions, as sourcing staff are replaced by an automated process. 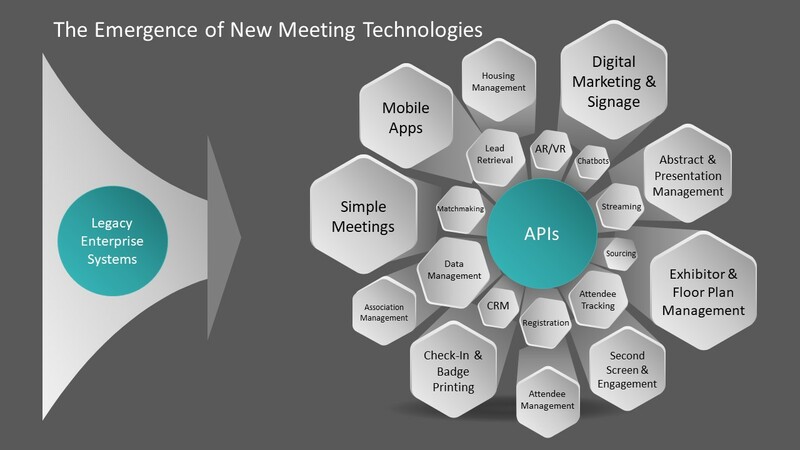 In summary, new meeting technologies bring specific pros and cons with respect to the disruption of overall meetings management programs, but also the potential for enhanced participant engagement and the measurement of attendee participation. Stay tuned for the next installment in this series, which will look at the emerging trends in simple/small meeting solutions.